AdBlue Emulator V5 NOx is compatible with several Iveco trucks. Below is the installation manual of V5 AdBlue emulator for Iveco vehicles. Before installing AdBlue Emulator V5 NOx on Iveco truck, please make sure that you have emulator programmed to Iveco program. You can order pre-programmed emulator, or you can change the program by yourself anytime you want. First of all, you need to turn off ignition on the vehicle. Demount glove box located in the cabin of the truck. Unscrew two mounting screws of the fuse panel, and unscrew two mounting screws of the diagnostic OBD2 connector. 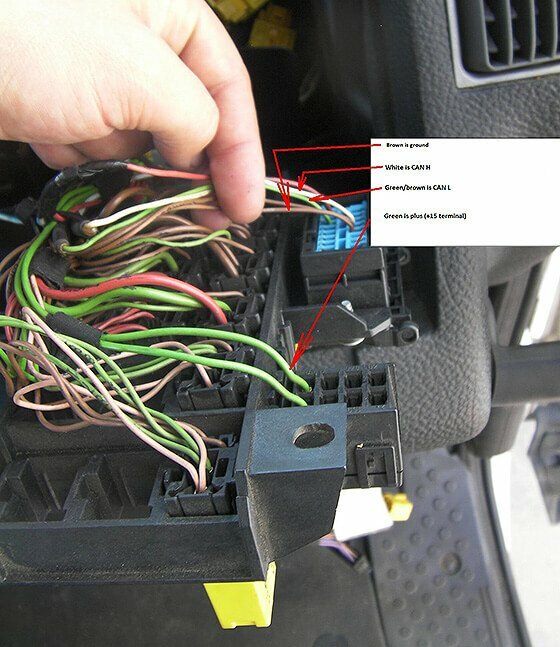 Join wires on the OBD2 connector. 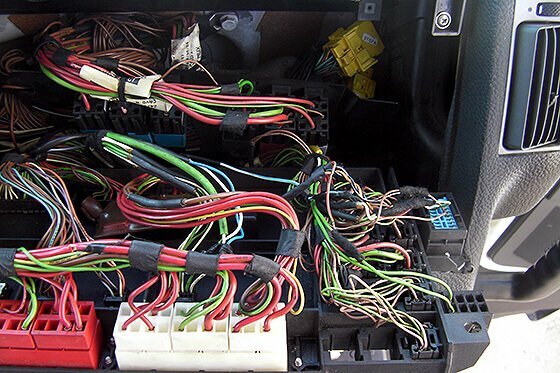 Connect brown any of brown wires to the black wire (ground) of AdBlue emulator. Do not connect other emulator wires if the ground wire is not connected. It is necessary for safety reasons. Connect the white wire to the brown wire of emulator (CAN LOW). Connect the green wire to the emulator white wire (CAN HIGH). 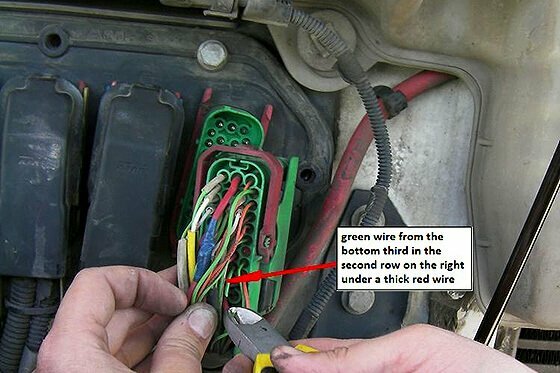 Connect any of the green wires (+15 terminal screw), for example from the ABS fuse to the red wire of the emulator (+24, this is the voltage if the ignition is turned on). Attention!!! Do not use power (+24) from the OBD connector. Remove two SCR system fuses (there are 5 and 15 fuses with the SCR abbreviation in the lower left corner of the fuse panel). Turn on the ignition. Check whether there is the level of DEF (Diesel Exhaust Fluid). If the level of DEF (AdBlue liquid) appears, it means that everything installed correctly. If the indicator EM lights on the panel, it means that the circuits EM are powered from the AdBlue fuse also. 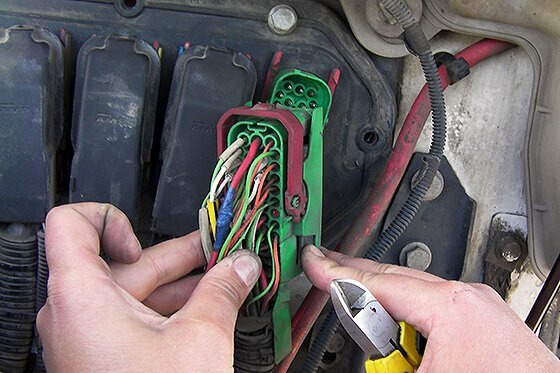 It is necessary to insert the fuses back, lift the hood and cut green wire. See the scheme. Fasten the emulator by the cable strap to not dangle. If any failure occurs, the “Check” lights up, and then, go out in the course of time. If there is no any failure, the indicator “Check” does not light up. 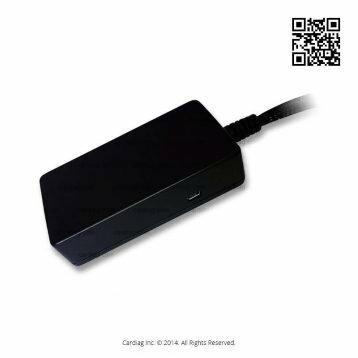 AdBlue Emulator V5 NOx installation manual for Iveco trucks was last modified: May 26th, 2017 by Cardiag Inc.